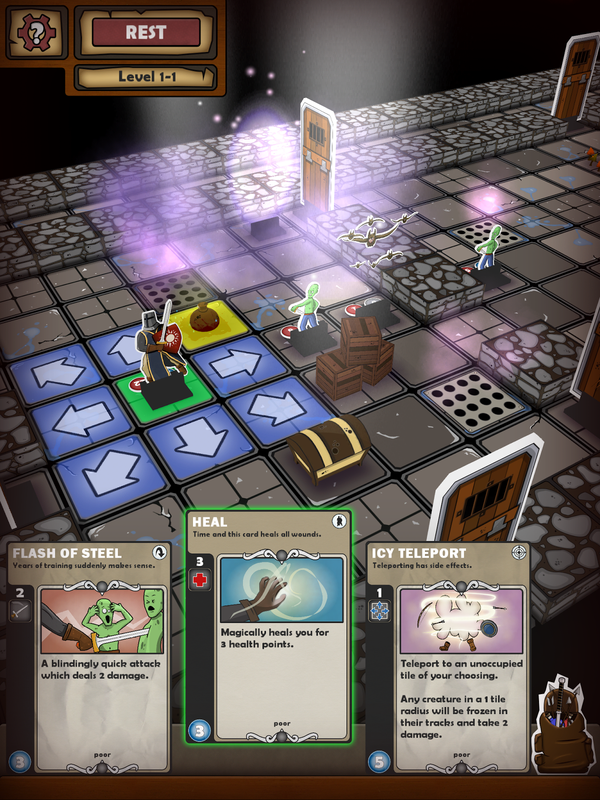 Card Dungeon (iOS, coming this week) recreates the experience of sitting around the kitchen table, playing board games, and if you ever played Heroquest (have a look at the game here), then you'll already be familiar with the atmosphere. It's a roguelike that has you control one hero battling through a series of dungeons, and I think it's a terrific game. Plus, it's funny. Really funny. Now, part one of an interview with Fredrik about the game. 1. Card Dungeon has a very tabletop feel to the gameplay. Even the visuals evoke playing around a kitchen table. What kinds of tabletop games did you play growing up? How did they influence your sense of how games should play? I knew of Heroquest and Dungeons! and the others from seeing them in stores when I was younger, but I don't exactly come from an affluent family, so they were always out of our price range. I played them with friends who had them and I always wanted to have them. It's the last decade or so that I have really started to go back and play those older board games I lusted over back then. A friend of mine have a copy of the original Heroquest and I was blown away by the little miniatures and tokens and all that card board. I also picked up Dungeons! to play with my kids, which is a straight up Card Dungeon in board game form. I guess I am reliving my childhood through my own kids, but now I can actually buy those games that were out of reach for me back then. What we did have, though, was dungeons and dragons and a few other role playing games like Shock and Mutant and I always played those games since I was a kid. I initially wanted Card Dungeon to be have more puzzles and traps and be more like a digital version of Gygax Tower of Terror, but it was just too much work for us. Maybe I'll get to patch those puzzles and deathtraps in later. 2. When did you first thinking about the concept of Card Dungeon? How long have you been working on the game? I think it was a bit over 4 years ago when the idea first popped into my head. It was supposed to be this simple little dungeon crawler where you had a draw deck of cards that were your actions, so that's always been there. Once you used a card you would draw new cards up to 5 from the draw pile. Once the draw deck was empty it would reshuffle and start again. I think I have the files for the paper prototype still. This was something that we were going to knock out in a couple of months, but after finishing the first paper prototype and testing it with some friends, and seeing that the idea actually worked really well, the game just grew and grew and grew into the monstrosity it is now. As we developed it we discovered that the randomness that works in board games doesn't really work in digital games. The player doesn't feel in control and can't plan his moves when he doesn't know what cards are coming up. We played with all kinds of ideas regarding the cards in your hand. We started with a new random card everytime a card was used, went into a collection based game, then had this crazy roulette wheel idea there for awhile, until we both started thinking that simple is better and said 3 cards, new cards must replace one on your hand. It's simple strategy, but it works on mobile where the attention span is counted in single digit minutes instead of hours on a PC platform. Once we hit on the idea that cards degenerate we found the balance that we were looking for. The dropping down of the tiles is straight from the exploration of tile based board games like Mage Knight and Archipelago where when you hit an edge, you put down another tile from a stack of them. Ryan then had the idea of dropping everything down from the sky like people putting tiles down on a table. 3. How many people are on your team? Did you form a new team just for Card Dungeon? Just two people, me and Ryan Christy. We did hire a musician, Ian Dorsch, to make the soundtrack for the game, and I am so happy we did. Good music really brought out the dungeoneering of the game to another level. 4. What influenced the whimsical humor that is always in the forefront? The slightly-anxious hero reminds me very much of a Monty Python character. Honestly, I don't know. Whatever makes us laugh goes in the game. I grew up on Monty Python and other comedy of that sort, so I guess it's built into me. And if it can make me laugh maybe some other people will chuckle. There's not enough humor in games today. I think my favorite is the mole shark. I am so happy we took a week to implement his behaviour. His goofy grin and sudden appearances makes me laugh everytime. Games Week Featuring Card Dungeon!